Currently viewing the tag: "Spheres"
They say you can't go home again. If the recent track record of Dutch deathsters Pestilence proves anything, it's that you may get home again, but you can't stay there long. 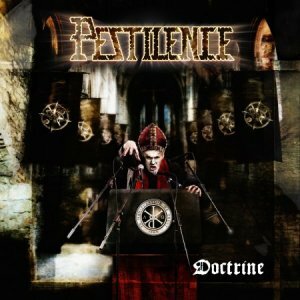 Pestilence had a few significant contributions to the death genre in the late 80's and early 90's, most notably the excellent Consuming Impulse from '89 (a nasty, vicious slab of ugliness and a top ten all time death album IMHO) and the very solid Testimony of the Ancient release in '91. Then they radically shifted styles by incorporating copious progressive jazz fusion elements into the Spheres opus and alienated many fans in the process. That essentially closed the book on Pestilence until their 2009 reunion album Resurrection Macabre, which did indeed go home to their early death metal roots and kicked a fair amount of arse too. Now, we get their second post-reformation platter and much to my chagrin, back comes the progressive jazz-fusion elements to muddy the waters (though not to the extent they did on Spheres). This leaves Doctrine a squirming, writhing mutant offspring, half Consuming Impulse, half Spheres and it feels like an album tearing itself apart with inconsistent, incompatible ideas. Needless to say, I'm not very jazzed about this.